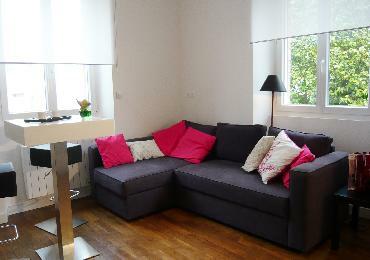 Vacation Rentals & Holiday Rentals in France : House Rennes. 1000gites.com vous propose des rentals de vacances Rennes avec photos, disponibilités et descriptifs détaillés. House in town with 1 bedroom, dining room, living room, open-plan kitchen, 1 shower room, 1 WC. Number of beds: king-size bed (1). City break comfort, close to the city center (10mn walk from the historical heart,5mn by bus),in a very quiet street close to shops, this house will charm both by its interior very bright and contempory than by its exterior in the beautiful days(garden furniture).On-site parking. Rates: week end(170€), week(440€). Discount from 2 weeks rental. Capacity: ideal couple(2).No animals. Non smoking self catering.